You are here: Home › Stayfitcentral Health & Fitness Blog › Health & Fitness Blog › Buyers Guides › Creatine – Get The Facts Here! Creatine is made up of 3 amino acids, l-arginine, l-glycine, and l-methionine. These amino acids are combined in the kidneys and liver to make creatine. Fifty percent of creatine is produced by your body in this way and the other fifty comes from the food you eat or supplements you take. So, your creatine level largely depends on your diet. Also detailed in this article are creatine rich foods and supplements. Let me start by discussing some of the science, and how it effects you! L-glycine and l-arginine are two very important amino acids responsible for cellular growth, energy, and the fist step in producing creatine. The combining of these two amino acids takes place in the kidney and pancreas. The third amino acid that is needed to make creatine, l-methionine, is not manufactured in the body. You can get it through food or nutritional supplements. Foods that contain the greatest amounts are: eggs, meat, fish, and poultry. Once your body obtains it from food it can be combined with l-arginine and l-glycine to make creatine. Once created, creatine travels through the blood to be stored. Most of it (95%) is stored in your skeletal muscle and is for during short, powerful bursts of energy. This is what makes creatine so important to us athletes and fitness buffs! It gives you the power to perform plyometric push ups, kick a soccer ball, dead lift heavy weights, sprint, hit a baseball, and so on…you get the picture! Say for instance you want to increase your power to kick harder, lift heavier weights, sprint faster but your fatigued muscles are too much of an obstacle. I know about this personally as I would like to run faster sprints on inclined stairs. Unfortunately, under normal conditions your muscles run out of stored creatine quickly and as a result tire easily. These short bursts of energy, supported by your bodies stored creatine, lasts less than a minute. You then have to rest to prepare yourself for your next explosive movement. You would like equal or more energy to power through the next set and not feel so fatigued that you just can’t dig deep enough to pull out another burst! Ok let me be scientific one more time! Creatine is stored in your muscles as phosphocreatine. Phosphocreatine is used to make ATP, the compound that your body uses for immediate bursts of energy! Lactic acid production increases after ATP is all used up. This is when fatigue begins too. Like I said, the average person only has enough energy for a few short, intense bursts before they feel the lactic acid and fatigue. However, using creatine can increase the amount available. This means you can exercise harder and longer before you start feeling fatigued! Creatine also makes the process of recovering for the next burst much faster so fatigue stops sooner and your again ready to lift, sprint, or complete a set of push-ups with a lot of energy, faster! And now, you have a better understanding of what is creatine! One of the main effects you’ll experience when you take creatine is that it helps you gain weight and increases the size of your muscles. One of the reasons for this is that it helps to shuttle more water into your muscles. Let me illustrate this point. Imagine an onion being immersed in water. After a few minutes it will balloon in size as the water gets into the cells of onion. The same thing happens to your muscles when you take creatine. As more water is shuttled into and stored in your muscles they get larger and, as a result, balloon! It’s often referred to in the sports supplement world as cell volumizing and is just one of the many positive effects of creatine. Studies also show that along with weight training, taking creatine increases the number of satellite cells within your muscles. These are the cells that help repair damage and turn on the muscle building process! These results suggest that supplementing with creatine can help you build more muscle, especially when you lift weights too. We also know that creatine delays fatigue during your workout by giving your muscles more fuel. This means that it can help you train harder, longer. This is one of the primary reason thousands of elite and professional athletes use creatine. Unlike banned substances with similar benefits it’s also legal to use in every sports organization. Last but not least, creatine is good for your brain too! Studies show vegetarians score higher on IQ and other tests for mental function when they supplement with creatine. Approximately 2% of creatine produces a waste molecule called creatinine. Your kidneys filter the creatinine from your blood. So, if you have kidney disease, it’s not recommended for you. However, research shows that there is no adverse effects on your liver or kidneys (in healthy people). Research also shows that athletes who take it regularly for several years experience no adverse side effects either. The best natural sources of creatine is found in wild game! This includes: bison, bear, deer, rabbit, wild boar, raccoon, squirrel, pheasant to name just a few! Other great sources are fish, red meat and chicken. To give you a better idea, about 2-3 lbs. of beef and salmon, yields about 5.5 grams of creatine; 2-3 lbs. of herring contains 7-10 grams; 2-3 lbs. of pork yields 6 grams, 2-3 lbs. tuna yields approximately 5 grams. Now, let’s discuss your daily dosage of creatine to further understand ‘the best creatine’ and how to get it into your diet. Here are some numbers to give you an idea of food quantity to get your daily dosage of creatine! Your body requires approximately 2-5 grams of creatine daily for good health and brain function. So, 2-3 lbs. of beef or salmon for example, can provide your daily dosage! You probably eat 1/4 of a pound of meat at every meal; if you eat 3 meals per day, then you’ve had 3/4 of a pound. At minimum you need 1 1/4 pounds more to possibly get 2-5 grams of creatine in your diet. Then if you cook it, well you need to eat more because the heat killed some of the available creatine! That quantity of meat is too much for any one person! This is why so many athletes and fitness enthusiasts take creatine supplements! Read Creatine Supplements – A Buyers Guide to learn which is best for your needs. The most effective and proven way to take creatine for building muscle mass is by starting with a ‘creatine loading phase.’ This phase saturates your skeletal muscle with creatine for maximum muscle growth. See the following steps for detailed instructions. Step 1. Take 20grams of creatine for 5-7 days. You can spread out the dosage by taking 5grams, 4 times per day every 3 hours. Step 2. Then, take a maintenance dose of 3-5grams per day, for 2-3 months. Those of you with sensitive stomaches, like this writer, drink it with food! Another option is to take 3-10 grams daily. This will fill your muscles with creatine without having to follow a loading phase. The only difference is that it may take 2-4 weeks before you notice any significant benefits. After the loading phase, the best time to take creatine is after your workout to maintain your performance enhancement. You should be taking about 3-5 grams daily (one scoop) at this point. You can also add it to a protein shakes that you drink as a meal replacement or snack. You’ll save the most money by purchasing the largest size creatine available. I like to buy a 1000-2000 gram tub since it will last several months. 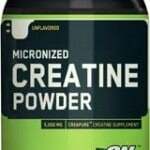 I like Optimum Micronized Creatine since it mixes easily in water and is very inexpensive. Creatine monohydrate is the most popular type of creatine supplement available on the market because it is the most stable form of creatine, meaning most of it doesn’t turn into its worthless byproduct, creatinine. Liquid and creatine ethyl ester supplements quickly degrade into creatinine once its in your body. Taking creatine monohydrate will also give you the best results as more will be stored in your muscles and in turn be available for energy and building muscle. In summary, now you understand the reasons behind why so many athletes supplement with creatine! It’s not a drug, but it is the natural wonder fuel for the athlete striving for more, for better performance, greater strength and speedy recovery without side effects! And for those vegans and vegetarians who want to take creatine, it can help your brain function better too! 1. Caroline Rae, Alison L Digney, Sally R McEwan, and Timothy C Bates. Oral creatine monohydrate supplementation improves brain performance: a double-blind, placebo-controlled, cross-over trial. Proc Biol Sci. 2003 October 22; 270(1529): 2147–2150. 2. Olsen S, Aagaard P, Kadi F, Tufekovic G, Verney J, Olesen JL, Suetta C, Kjaer M. Creatine supplementation augments the increase in satellite cell and myonuclei number in human skeletal muscle induced by strength training. J Physiol. 2006 Jun 1;573(Pt 2):525-34. Epub 2006 Mar 31.